The French Grey Palette - Oak House Design Co. I have been obsessing about French Grey for a couple of months. 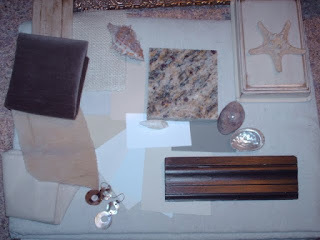 It's a warm grey tone found in seashells that goes with gold, bronze, and brushed nickel. It also complements mother-of-pearl found on the inside of some shells. It's neutral--but has personality. I put together new palette of colors and inspiration that I am thinking about. I am finding that I am not as big a fan of contrast as I once thought I was. This palette is very calming and natural. I see natural woven fibers like seagrass and rattan, champagne and pearl glazes, and dark wood flooring. I love the pearlized inside of the seashell against the french grey. Restoration Hardware has a color called "Graphite" in their Slate Paint Collection that I think would work very well. Add hardware and poly to the entry chest in my foyer. Add poly to side table in living room. Sand, prime, paint/glaze, and poly to cedar chest in family room. Finish repairing dining set, repaint entire set, and recover seats. With my 18 month old running around, that's probably enough. Check back for pics of progress. First off, I love what you put together. And WOW, Layla is one of your followers?! I could only wish for that!!! Wow! You are a brave woman! Doing all that with an 18 month old running around? When my girls (now 24 and 23) were that age, I felt special if I actually got DRESSED. Also love the french gray. Hey! I just saw that your last post was Dec '09. Are you ok? I wandered here from AnNicole's blog. Too busy with a little one? I think I'd have had a hard time blogging and keeping up with kids.